PoliceAuctions.com, home of police auctions and government auctions on the web, will be using social media giant Facebook to auction a PSA/DNA authenticated and graded Pete Rose autographed baseball. The one-dollar no reserve auction will end on Sunday December 15th. Pete Rose is the all-time Major League leader in hits, games played, at-bats, and outs. PoliceAuctions.com, home of police auctions and government auctions on the web, is auctioning an autographed Pete Rose baseball. The auction closes on Sunday December 16th. Pete Rose is the all-time Major League leader in hits, games played, at-bats, and outs. He won three World Series rings, three batting titles, one Most Valuable Player Award, two Gold Gloves, the Rookie of the Year Award, and made 17 All-Star appearances at an unequaled five different positions. Three years after he retired as an active player, Rose agreed to permanent ineligibility from baseball amidst accusations that he gambled on baseball games while playing for and managing the Reds, including claims that he bet on his own team. PoliceAuctions.com, home of police auctions and government auctions on the web, is auctioning an autographed Pete Rose baseball. The auction closes on Sunday December 16th. The Pete Rose autographed ball being auctioned is a Rawlings official baseball that is sealed in a plastic display cube. The signature includes the inscription “I’m sorry I bet on Baseball”. 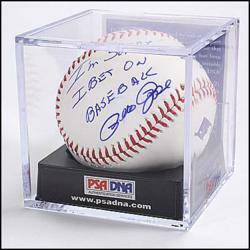 PoliceAuctions.com will be using their Facebook fan page to promote the auction for the Pete Rose baseball. PoliceAuctions.com fans will be able to view photos for the ball and link back to PoliceAuctions.com to bid.